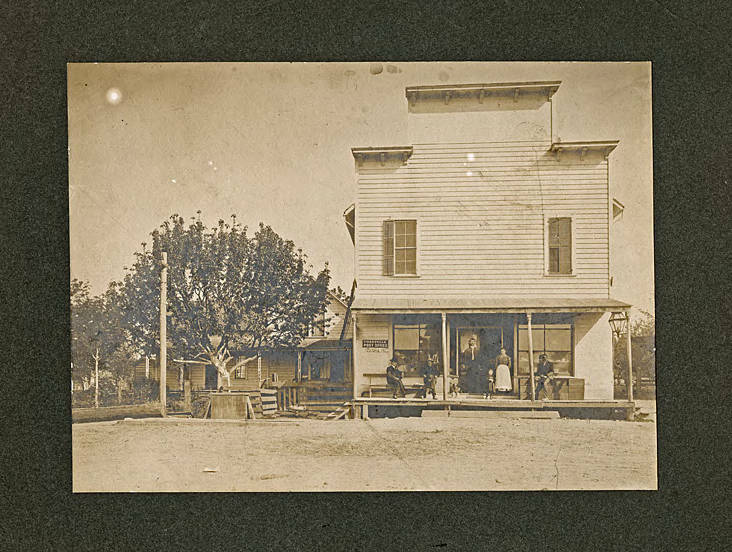 Sepia-toned image mounted on heavy mat of a family and several other people standing on the front porch of a two-story, square fronted building that fills the right side of the image. A man and woman stand in the recessed doorway; her dress is polka-dotted and has lace edging on the collar and the caps of her sleeves. She wears a white apron. He wears a jacket and shirt, but no tie. A little girl stands between them, wearing a dark, long-sleeved dress. A dog lays on the step to the left of them. Three other men sit on benches and boxes in front of the store, two in work clothes and one in a suit with a derby-style hat perched jauntily on his head. A printed sign on the right of the building reads 'Tigardville Post Office', and a hand-lettered sign beneath it reads 'Portland 10 1/2m' with a hand pointing to the left side of the image. A two-story, cross-gabled house is visible behind the store to the left, behind a tree, and a power pole stands in front of the yard. A large lamp hangs from the far right side of the store's porch. [back] C. F. Tigard, Rosa Tigard (wife), and daughter Grace. Their home, store (lodge hall above,[sic] about 1905 or 6.